Dental implants are the closest dental restoration to your original teeth. They are natural-looking and provide the functionality of a normal tooth. Dental implants require the same maintenance as a normal tooth: brushing, flossing, and regular checkups. Dental implants can replace missing or severely damaged teeth and can be used to secure restorations like dentures and dental bridges. Patients with dental implants often have greater satisfaction and results than other types of dental restorations. 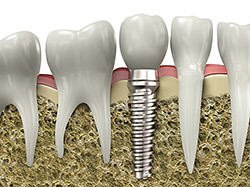 Dental implants have two primary parts: a small titanium post and a crown. The small titanium post is first implanted into the jawbone. Titanium is used because of its unique compatibility with human tissue. Unlike other metals, the jawbone will grow naturally around the titanium post and secure it in place. After the post is secure the dental crown or other dental fixture is attached to the post. The titanium post acts similarly to a natural tooth root and the crown provides a natural looking tooth and biting surface. Dental implants can replace a single tooth or many teeth, regardless of whether the tooth loss was caused by disease or injury. 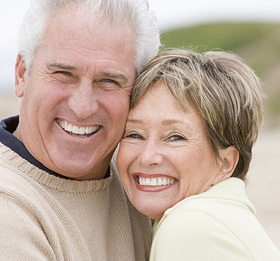 Implant-Supported dentures are becoming a popular option for individuals with multiple teeth to replace, who would like additional support and retention over a traditional denture. This option incorporates an implant that has a snap-like attachment with a corresponding snap on the underside of the denture, allowing the denture to “snap” in place. This is also attractive when, cosmetically, the normal metal clasps of a partial denture may be visible and unappealing for the patient. There are several variations of this option and all provide excellent retention and maximum comfort.